At the moment when a person becomes inspired to make a change, how can an organization support him or her to make that change in their life or to facilitate that change in the lives of others? Yesterday, during a conversation with my new friend Holly (who also happens to be my doppelganger), I had an inspiration on how to accomplish this. It’s an idea inspired by the collision of several others: A Recipe for Free Range Learning, my experiments with SpacedEd (now Qstream), my long ago experience with Flylady, the concepts of Optimism Bias and activation energy (from the Happiness Advantage), and the “Learn This” Button. But before I explain the idea, I also have to preserve the story here, because it’s really eerie. On Monday night, my husband tagged me in a picture and added the caption “Must … stop … self … from participating in more projects. 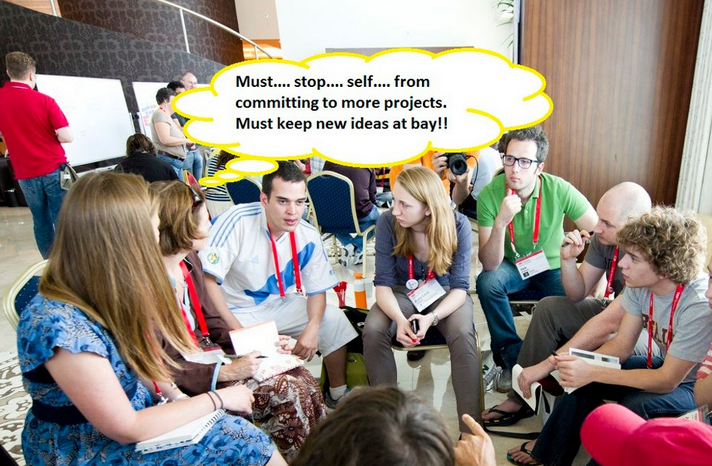 Must keep ideas at bay.” For a minute, I believed it was me in the picture. But then I realized I hadn’t met a single person in the group of people in the picture. So, it wasn’t me … but darned if it didn’t look like me. It was really bizarre. So on Tuesday, I decided to try to identify the “doppelganger” because she had fooled both my husband and myself with her uncanny resemblance. Lo and behold, when I walked into the Summit Lounge, the same group of people were assembled in a circle having a conversation about one of the actions. I identified the one that looked like me, and made a mental note to find her later. 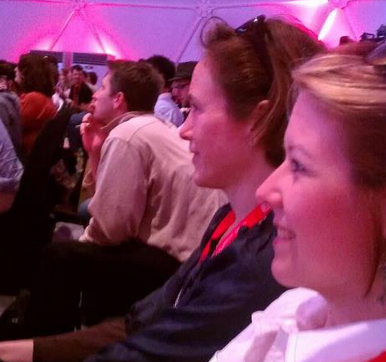 In the opening talk, she walked into the venue and sat down right next to me. I introduced myself and explained that she and I might be doppelgangers (at least from the side profile). So we started chatting between talks and one thing let to another. Before long, we were talking about the Action Team she was involved with, and she expressed frustration that they seemed to be stuck. When she explained what they were trying to do, something from the previous nights’ talks collided just so with a collection of talks and writings from the past, and a clear path to a solution presented itself. I shared it with Holly, and she agreed that it was a really great solution to the constraints of their problem space: How to turn ideas into action. I suppose that Holly and I were fated to meet, that she was meant to pose this problem to me, and I was meant to generate a solution out of the myriad of random stuff running around in my head. Because I’ve been asked to share this strategy at least a half-dozen times in the last 24 hours, it seems work writing down in its entirety to preserve the original details. The fundamental idea is to treat each desired behavioral /action change as fusion of two streams: an action stream and a social coaching stream. Together, this blends to form a set of instructions and the spice for a sort of “action recipe.” Suppose that Holly has just watched an amazing TED video about using less plastic waste, and she wants to take action. (1) At the moment of inspiration (in this case, the viewing of a TED or TEDx Talk), Holly should have the option to “make a change” or take action” on the screen. (4) Holly can click on multiple options on the list (to compare them) and then click on “See ingredients.” The ingredients list would simply tell her what kinds of resources she would need to have or purchase to carry out the action. For example, in order to cut down on the amount of purchased plastic, Holly would need to find or purchase two water bottles (one for home and one for work). (5) Holly chooses to receive her coaching by SMS, so she follows the directions to set this up, and then the action begins with the first of 30 daily texts (the number of messages would vary based on the type of action and chosen level of impact. This string of 30 (or so) messages would be a fixed set of action instructions, written by the author of the recipe. Now for the social coaching aspect. In combination with these messages (a la flylady), the system would provide coaching in real time. For example, Holly replies to the last text with the number “3” … now the system adds her 3 refills to the global count and sends her words of encouragement. Another type of social coaching might be inspirational stories, curated by someone keeping an eye on this set of recipes and receiving feedback from those who are nearing the end of their behavioral change. (6) At the end of 30 days, Holly is asked to rate the recipe on a scale of 1-5 (good recipes should eventually rise to the top based on rating and number of times it has been used). Recipes at different impact levels would have different ingredients lists, different time frames, and different actions. For example, if you want to change your organization, it would be incredibly important to get buy-in from a leader in the organization. So a first step might be to make an appointment with two potential “champions” for the cause, and show them the video that inspired you. It is, in my opinion, crucial that the behavior change involves a “push” of coaching to the participant (too easy to forget you meant to change) and that it includes not just an action process, but a personal element of coaching. Now … I’m tired and that’s all I’m writing about this tonight, because I need to get at least ONE night of solid sleep at this incredibly awesome TEDxSummit event.